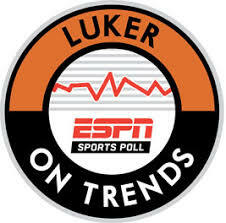 Since January 2011, Luker on Trends and SSRS have partnered up to bring ESPN the best the research industry has to offer – high quality data collection and breakthrough strategic intelligence. Since 1994, the ESPN Sports Poll has formed the foundation for measuring sports fan levels in the United States. With more than 490,000 interviews conducted daily over 24 years, ESPN Sports Poll provides the longest-running continuous tracking service on sports fans in the U.S. The ESPN Sports Poll currently tracks interest in 47 different sports and properties, technology engagement, media usage, television viewership and streaming, attendance behaviors, and sponsorship support. The service plays an integral role in strategic decisions made by top leagues, sponsors, and media organizations in the sports industry. Data is collected 350 days a year from a nationally representative sample of Americans age 12 and older by SSRS. Interviews are conducted with 1,500 Americans each month via landline and cell phone, and offered in both English and Spanish.